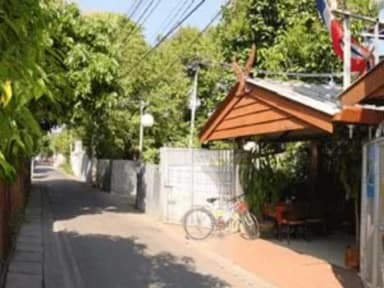 Our guesthouse is comprised of 2 buildings, 10 metres apart, conveniently situated in a small lane in the old part of Chiang Mai. We are just a 5 minute walk from Tha Phae Gate, and sanday walking street. Yourhouse 2, (1995) is a modern house. A basic rooms with private bathroom and hot shower. The reception, information and restaurant in yourhouse 3. 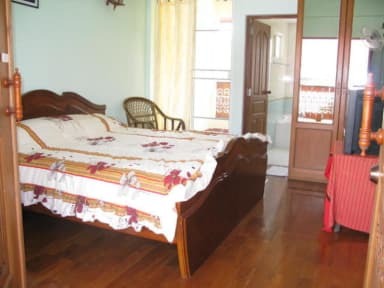 Yourhouse 3, (2008) The new house, all rooms are very luminous with wonderful teak wood floor.Each room with private bathroom, hot shower, bathtub, balcony, internet lan, wifi, and you may have TV and refrigerator. All rooms have A/C and may have fan. Our restaurant is also located in this building. We serve delicious Thai and western food at reasonable prices. We organize tours and trekkings to our exclusive area north of Chiang Mai. A variety of other areas are also available. A licensed TAT-approved guide is included in the price, as is food, accommodation, and insurance. Backpacks, mosquito nets and sleeping bags are also provided, as is a safety deposit box for valuables which you don't want to take into the mountains. We pride ourselves on offering a friendly, relaxed atmosphere and do our best to make sure everyone enjoys their time with us in Chiang Mai. Very, very nice place and very friendly and helpful staff! We felt very comfortable and would come again next time we are in Chiang Mai. Also, the location is great! Great value for money. In the perfect location, tucked down a quiet alleyway in the best part of the old town. Near many good restaurants, bars, street vendors and a market. Room, bed and bathroom were clean. Hot shower. Staff were helpful and friendly. This is a great guesthouse — if you’re looking for a hotel experience, look elsewhere. We stayed on a room at the yourhouse2 and it was pretty ok. Comfortable enough, but not the cleanest, even after you asked them to clean. Very calm place, location is just perfect on a quiet street near everything. The place was over booked, they offered a different unit. They also charge 900 baht for AC... The staff barely spoke English.